This is pretty much the prettiest science experiment we’ve ever done. 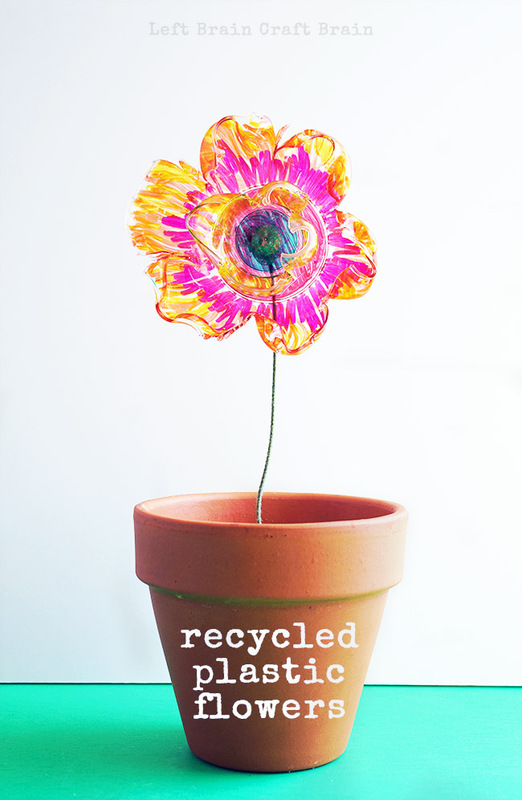 Through the magical chemistry of polymers, you can turn recycled plastic into a beautiful flower garden or bouquet. So save your plastic cups and plates from that party or snacktime at school and make someone just as happy as real flowers do. 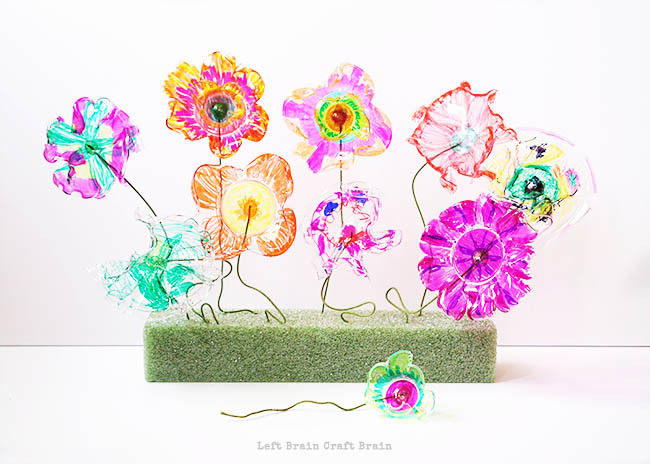 This is the Recycled Plastic Flowers Art and Science Project and it’s part of 28 Days of Hands-On STEM Activities for Kids, a fun blog series in February. This post contains affiliate links. 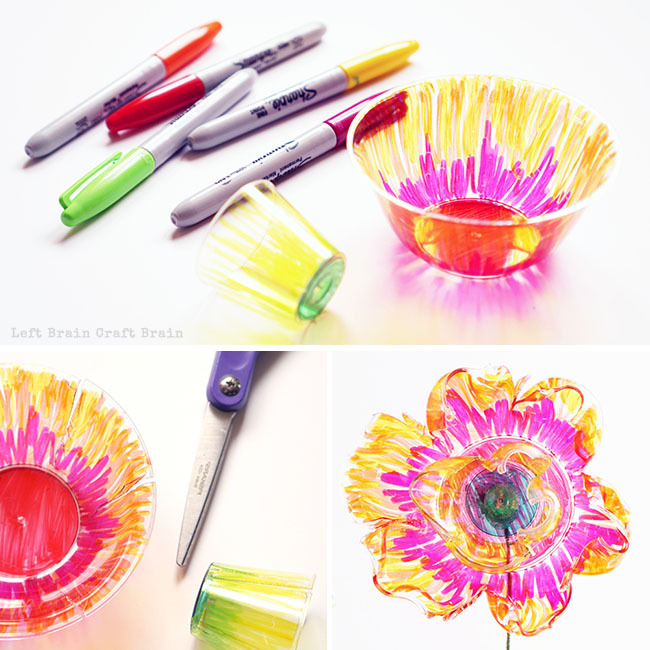 Color your plates, cups & bowls with Sharpie marker. I found that it helps to color them as completely as possible, especially in the very center because that’s where the glue to hold the stem goes. The glue shows if you don’t color that part. Cut slits in the sides of each using scissors. Careful as sometimes plastic pieces go flying. Place plastic pieces on foil covered baking sheet and bake for 2-5 minutes. Be sure to watch your pieces in the oven, both because it’s cool to see them melt and curl up, but also to make sure you don’t leave them in too long. Also, it’s a good idea to put the fan on or open a window for ventilation because melting plastic can get a little smelly. Let cool and hot glue gun your covered floral stem to the back center of the flower. You can also glue on an additional pieces of plastic that you want to add to the flower. I used one of the shot glasses to make a center petal trumpet like a daffodil’s. What’s the Science Behind These Flowers? 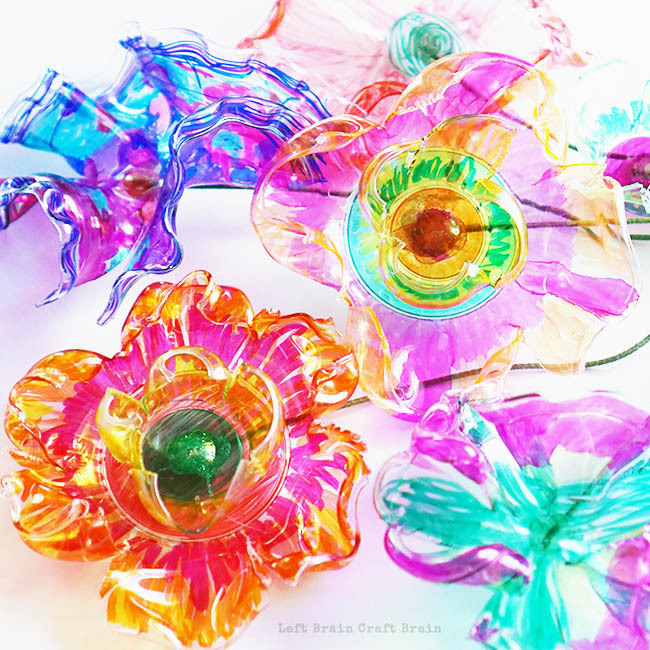 This flower forming works because of the characteristics of the plastic in the cups & plates. The heat of the oven changes the alignment of the polymer chains within the plastic. In the cup and plate manufacturing process, a polymer resin is heated, extruded, rolled into flat sheets and then molded. This process aligns the polymers into an orderly pattern, but the heat of the oven returns them to their naturally disordered, clumped state. Gravity and the placement of the cuts define how they crumple. #6 plastic works well in this project because its melting point is low enough for the oven to reach. Want to learn more about polymers? Try some edible ones with these Homemade Fruit Gummies. What do you think impacts the final shape of the flower? Form a hypothesis, then try varying the number and size of the cuts as well as the time in the oven. Did the results match your hypothesis? Form your conclusion. What would happen if you changed the temperature of the oven? The type of plastic? Would this work with other kinds of markers? Why or why not? Test it to be sure. There are so many things you could do with these flowers. I love the idea of a community art & science project. Everyone can cut and color their own flowers and just like snowflakes, no two will be the same. Then you can “plant” them in terracotta pots or in floral foam. They make a beautiful bouquet, too. I love that the addition of art to STEM makes this project really shine. 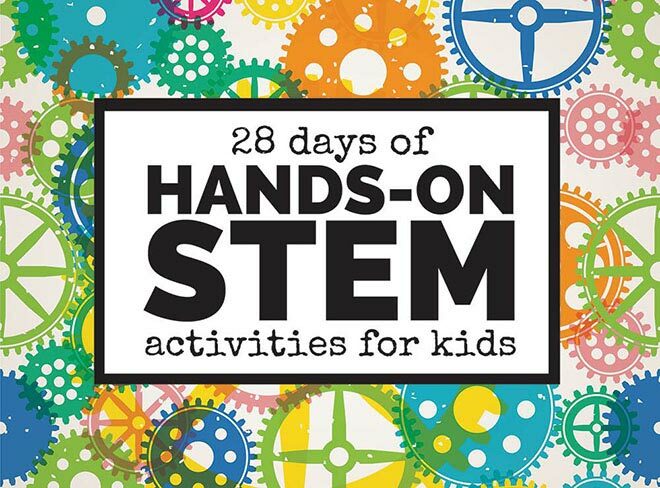 This post is a part of an amazing series of hands-on STEM activities for kids. I’ve joined up with 28 other bloggers and we’re creating 60+ fun science, technology, engineering & math activities. 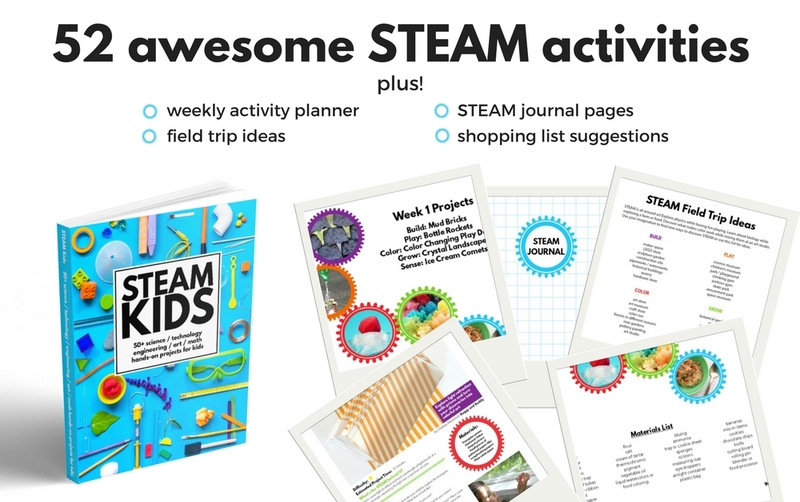 Each week is a different topic: STEM Goes Green, STEM Challenges, Coding for Kids & STEM On the Cheap. Click here for the full list of activities. Wow! These are absolutely stunning Anne! I think I might try these with my KG students this spring (and probably at home too!) They look like stained glass flowers. So pretty! Love your ideas!